"We would recommend a Pro Driver to anyone considering a new driver..."
"We have been very pleased with its installation and performance on our F-350. Numerous grease fittings, a well constructed bed with stake pockets, and outstanding LED lighting will prove to give us many years of service. We would recommend a Pro Driver to anyone considering a new driver...but not here in Mercer County." "I purchased my second Pro Driver Truck Mount this year. As usual I have no complaints...""It's been over a month now since I purchased my second Pro Driver Truck Mount this year. As usual I have no complaints...The driver has been working flawlessly since the day I put it to work...My new employee was on the driver within the first two days of being hired and now (a month and a half later) is running the Pro Driver truck I bought this past January." "I purchased a fence building business with older equipment; as I got busier I decided I needed to replace some of the equipment. 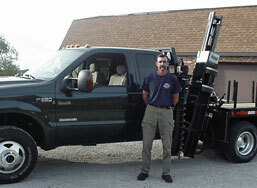 I purchased a Front Mount Log Cabin Pro Driver for a skid loader in 2005. 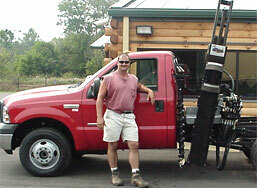 I was so pleased with the quality and workmanship that in 2006 I purchased a Truck Mounted Log Cabin Pro Driver and in 2007 a Log Cabin Pro Driver Side Shift Skid Steer Mount. In addition to the quality of the machine, the knowledge of the staff and the service is unbeatable. They truly understand the importance of these machines to my business and livelihood, and strive their hardest to keep me running smoothly. Whether it be a part or repair, I get the service I need in a very timely manner. Doing business with Log Cabin Fence has been nothing but a pleasure and I will be a continued customer." 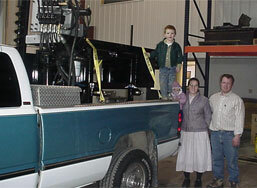 "We have been in business for over ten years. Several years ago we wanted to upgrade our driver. After checking out many units we were most impressed with what we saw in the Log Cabin Pro Driver. Now with over 50,000 posts installed 4+ feet in the ground we are very happy with this driver. At one point we had problems with a cylinder seal and we received a complete cylinder. The service we receive has been outstanding. When we plan to purchase another driver it will be a Pro Driver or none." 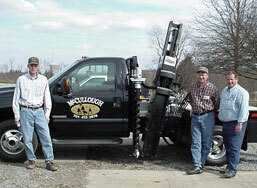 "That is what Darrin told me after I bought my first Post Driver from Log Cabin Fence in 2003. I had a problem come up that shut the truck down and Darrin interrupted his vacation to call me back and work through the problem. That is what I like about Log Cabin Fence: they use their own product and back up what they build. Too many times in today's society places are eager to sell their product but are nowhere to be found when you need service. 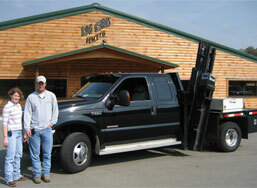 That is why I will be back at Log Cabin Fence for my third unit when the time comes."